SEOUL, Sept. 8 (Yonhap) — Samsung Electronics Co. said Friday the combined preorders for its Galaxy Note 8 in South Korea reached nearly 400,000 units on the first day, far outpacing its predecessor. The South Korean tech giant said around 395,000 consumers applied to purchase the phablet Thursday. The figure eclipses numbers for the ill-fated Galaxy Note 7, which managed to draw in 380,000 preorders over a 13-day preorder period. The previous device was removed from the market altogether due to faulty batteries that caused some to catch fire while being recharged. Earlier this year, Samsung received preorders for 550,000 units of the Galaxy S8 smartphone in the first two days. Samsung said the 64-gigabyte edition accounted for 65 percent, with the most popular color being blue. 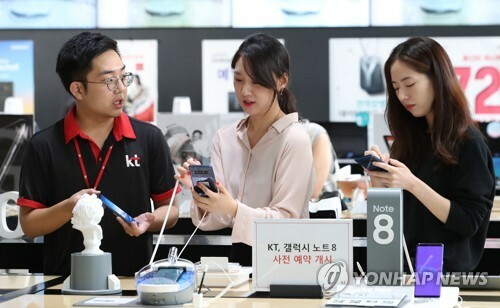 Industry watchers said Samsung may log more than a million preorders for the Note 8 in South Korea during the eight days it receives requests for purchase. The official release of the Galaxy Note 8 is slated for Sept. 21, although those who preorder the device will get it starting Sept. 15. The price tag of the 64GB edition stands at 1.09 million won, and that of the 256GB edition is at 1.25 million won.